Since 2009, Dejan Pavlovic’s FLS-system (the color-guided-system) has been developed with the Main-Taunus-Kreis in Germany, which offers students, teachers, administrative staff and external visitors a faster orientation in the schools. In addition, security forces, such as rescue services, fire brigades and police forces, are also projected to have a simple orientation within the school buildings in order to be able to provide assistance as quickly as possible, especially in emergencies or crises. We are constantly developing the FLS and are in direct contact with the schools and the police to implement new ideas and advice. Meanwhile, the FLS has convinced several counties and schooliers that this system will be in time. In addition to the public and visible part of the FLS (door markers, entrance markers, signs, etc. ), two types of FLS-standardized orientation plans are created for the police, fire brigade and rescue services, but these are only available for internal use. Barrier-free elements are integrated in the FLS as required. Thus we are marked barrier-free accesses to buildings on the orientation boards, and an additional form of communication can be applied to the door markers and orientation boards using Braille writing or tactile writing. In principle, the FLS can be combined with other orientation systems. 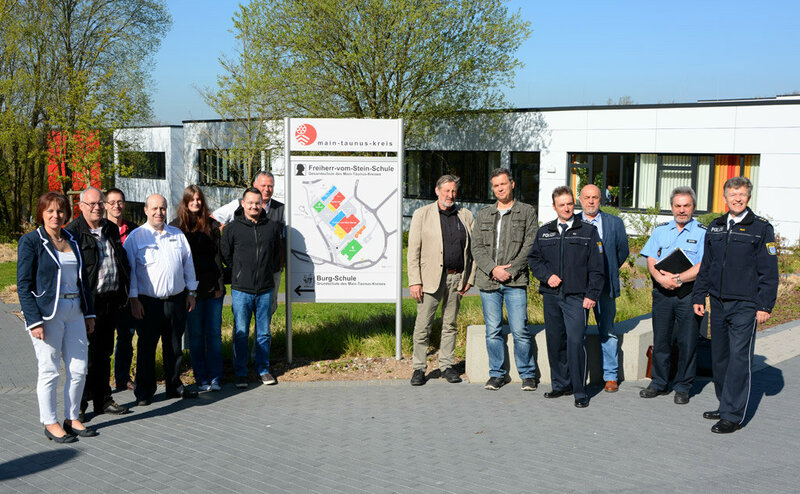 The visiting group from Marburg and Marburg-Biedenkopf with principal Silvana Stapel (left) and Dejan Pavlovic (5th from the right), First Chief Police Commissioner Manfred Braun and Police Director a.d. Jürgen Moog (right). A very easy to understand system The learning obstacle to understand and apply it is very low. Support is provided for infomaterial for parents and schools. Standardized and identical in all schools The FLS is implemented in all schools according to the same standard. Primary schools, secondary schools and vocational schools use the same FLS. Quick installation of the FLS If the ground plans of the schools are present, the implementation of the design and installation can be finished within 2-4 weeks. Maintenance-free and in case of damage quickly and easily renewable Since the system has no technical or electrical components, it does not need to be maintained. Experience shows us that the door markers are not damaged. However, if damage occurs or a door has to be renewed, the FLS components can be installed in minutes. Inexpensive Compared to other measures in the area of ​​prevention, the installation of the FLS is very favorable. Long-term benefits Compared to other measures (counter-intercom, cameras, security locks, etc.) the FLS is timeless. Flexible For expansion and new buildings, the FLS can be completed easily. Suitable for everyday use The FLS is not only suitable for the "emergency", as is the case with escape stairs or curses, but it can also be used in everyday life for the internal communication of the school, for events for visitors as well as for the students themselves. Perception of security Due to the presence of the FLS, pupils and parents are shown that the security of the schools is of great importance. Other technical resources are generally not conspicuous and are not noticed by the students. Existing and individualized infomaterial Information materials are adapted to the respective CI and the on-site door markers of each school.